It seems like the Philly skyline changes almost daily, with plenty of cranes rising and towers topping out. This map may help wrap your head around the mind-boggling amount of construction that's taking place throughout the city—a majority of which qualifies as high-end construction. Back in May when we first published this map, there were 29 high-rises. By August, some have been built and a couple of others have had their groundbreaking, bringing the grand total to 32. As Curbed.com reports, Mapping Inequality recently released hundreds of these maps that were created by local, government-recruited mortgage lenders, developers, and real estate appraisers between 1935 and 1940. It was all part of the Home Owners' Loan Corporation (HOLC), a New Deal initiative established in 1933 to boost the housing market. In Philadelphia and across the nation, local real estate experts defined neighborhoods comprising mostly of minorities as red and yellow—i.e. “Hazardous” and “Definitely Declining,” respectively. Based on this map, they considered everything south of Locust Street and north of Spring Garden street hazardous. In a sign of this city’s increasing popularity and burgeoning entrepreneurial community, a UK-based co-working company has announced that it is expanding to the US, choosing Philadelphia as its first base. Startup Home, a UK-based entity that provides co-working and co-living spaces to entrepreneurs and startups, made the announcement last week and plans to break ground in Philly by March 2017. It’ll join a growing list of at least 20 co-working spaces already in the city, but it will be the first to combine co-working and co-living into one. “The first building—we are planning to open between 3 and 5 in Philadelphia alone—will be in an existing building that we will refit for the occasion,” Simone Tarantino, US Executive Director, told Curbed Philly in an e-mail. Depending on how the first building goes, they’ll consider new builds for rest of the properties. One building will be dedicated entirely to women entrepreneurs and another will be home to IoT and Augmented Reality Lab. Tarantino says two developers have already expressed interest in working with them for the new builds. Why Philly? Tarantino points to the city’s young talent pool coming out of Penn, Drexel, and Temple. Currently, there are numerous co-working spaces in Center City including WeWork and CultureWorks. Kensington will also be home to smaller live-work spaces at 1222 N. 2nd Street, and what’s been dubbed Techadelphia, a mixed-use development that will feature a tech co-working hub on the ground floor and apartments for rent on the upper levels. At Startup Home, all three or five buildings will feature 20 startups each and 20 “nice-size” bedrooms that are bigger than the average hotel room, says Tarantino. Essentially, the rooms will be big enough for a tenant to live there for the six-month lease, but small enough that he or she is encouraged to spend the most time in the communal, co-working spaces. “The goal is to foster collaboration, network and sharing, key elements of success for entrepreneurs,” says Tarantino. Renderings are not yet available, but Startup Home is working with Mariotti Studio on the design. A new report by the Federal Reserve Bank of Philadelphia reveals that gentrified neighborhoods lost affordable rental units at five times the rate of non-gentrifying areas. Specifically, the city lost 23,628 units with rents that fell below the $750 threshold between 2000 and 2014. The researchers found that gentrifying neighborhoods were hit hardest by this loss. These areas—think Center City and University City—have lost low-cost rental units at five times the rate as non-gentrifying neighborhoods. Dwindling supply of affordable rental housing is a serious issue in metros nationwide, but it’s particularly prevalent in Philadelphia, given that it has the highest poverty rate of all major metros in the nation. 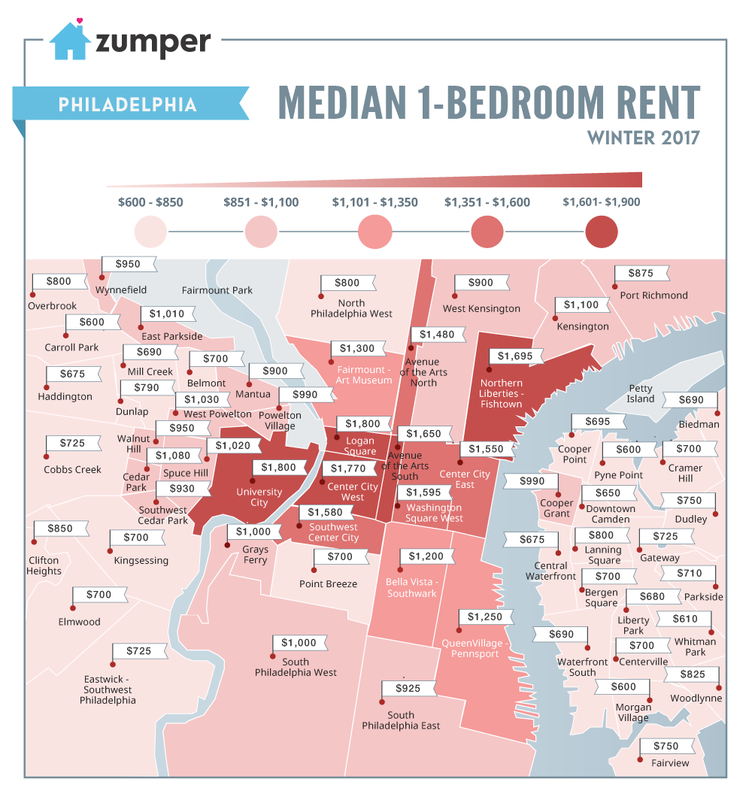 In addition, even more recent Census data shows that more than half of Philly renters are cost-burdened, meaning they spend more than 50 percent of their income on rent. So, where is all the affordable housing stock going? There are a few factors. In gentrifying neighborhoods, they’ve been replaced by amenity-driven, market-rate apartments—Philly was number one in new walkable construction this year. With these new luxury apartments, rents continue to rise, making the neighborhood increasingly less affordable. Nearly 70 percent of new construction in Philly since 2014 has been on the high-end, with these apartments averaging about $1,795 per month. Rising rent is also a contributing factor in non-gentrifying neighborhoods, but less so than conversions to owner-occupancy, abandonment, or demolition, the researchers write. 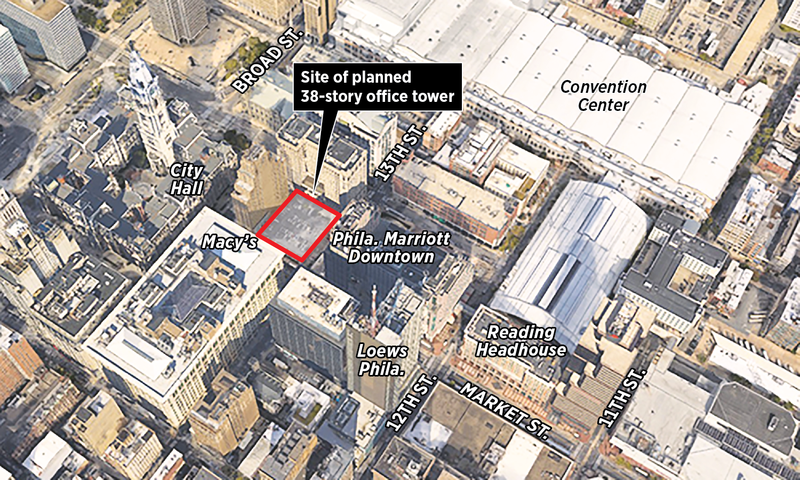 A West Conshohocken developer plans to build a 38-story office tower at the long-vacant lot at 13th and Market Streets. The building could be ready for occupancy by early 2020. The site at 1301 Market St. was previously occupied by a row of blighted buildings from the early 20th century that were cleared in the 1990s. The space is currently used as a parking lot. If completed, the tower would be the first so-called trophy-class office property in Philadelphia’s Market East sector east of City Hall, traditionally a lower-end market, said Lauren Gilchrist, Philadelphia research director at commercial real estate firm JLL. But with Market East office rents now close to those of the city’s main business corridor west of City Hall, Oliver Tyrone Pulver’s plan for high-end offices there could be justified, Gilchrist said. Also helping draw tenants are the Market East area’s high concentration of train and subway stations and the stores and restaurants opening to serve its growing residential population, said Robert Fahey, an executive vice president at commercial real estate services firm CBRE in Philadelphia. Other projects in the area include the redevelopment of the Gallery at Market East shopping mall and the East Market residential and retail complex on Market Street between 11th and 12th. 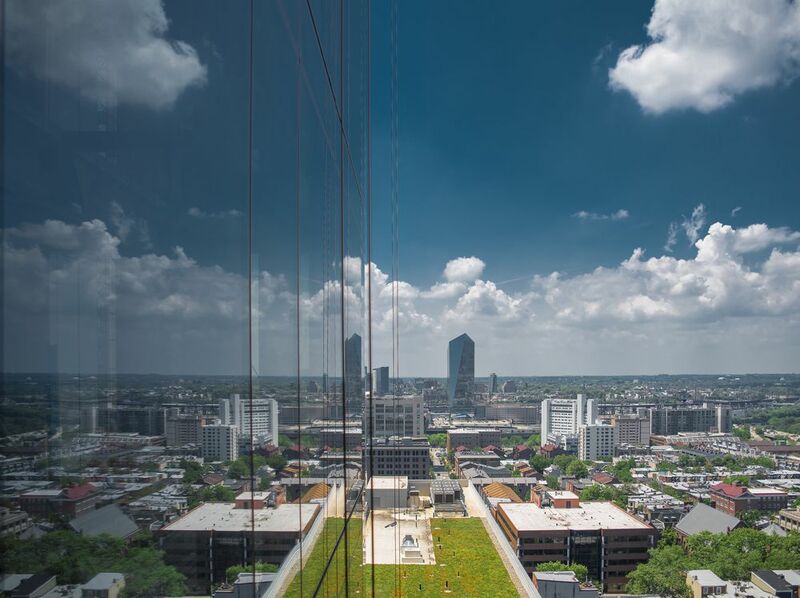 “That side of City Hall is transforming faster than any other part of our central business district,” he said. HOW MUCH HOUSING (in Sq Ft) can $1 Million buy you - in various cities? Philadelphia still looks like an interesting "low cost" option. Creatively titled “The 1,500 Affordable Housing Units Initiative,” the proposal calls for the construction of 1,000 affordable rental units and 500 purchasable homes, with the goal of reducing the backlog of 110,000 people on the Philadelphia Housing Authority’s waiting list. The 500 homes would come from transferring city-owned vacant properties to non-profit and private developers for low fees with a restrictive deed covenant attached, requiring that they be sold to households who earn between 80 to 120 percent of the Area Median Income. Philly’s AMI is officially $78,800 for a family of four, though PlanPhilly’s Jared Brey notes the actual median income in Philadelphia County is $37,016. The 1,000 rental units would be financed with a $100 million bond issue and some complicated public finance alchemy leveraging an underused 4 percent federal Low Income Housing Tax Credit. In 2012, for every 100 extremely low-income renter households in Philadelphia there were only 37 available affordable rentals units, according to the nonpartisan Urban Institute in Washington, D.C. In total, there were 43,700 affordable and available rental units for 117,578 extremely low-income renter households in Philadelphia. Clearly this is a huge problem. But it isn’t really a housing problem — it’s an income problem. The housing itself is quite cheap here compared to most of Philadelphia’s peer cities. The real issue is the 28.4 percent poverty rate, one of the highest in the nation. Cheap as the housing is in absolute terms, a sizable segment of the population still doesn’t earn enough money to afford it. So many poor people are living in the city of Philadelphia precisely because it IS CHEAP. The quintessential first-time “starter home” seems to be disappearing. Yikes, renters. According to the latest data from real estate firm Zumper, one-bedroom apartment rental prices are up more than 14 percent since February 2016. Philadelphia was the 17th-most-expensive city to rent in this month. The increase has been gradual (up just about 0.7 percent from last month), and if there’s good news to be had it’s that two-bedroom unit prices remained flat. One-bedroom units are up to a median price of $1,370 monthly while two-bedrooms remained about $1,500. The same report shows the fastest growing rents are in “South Philadelphia West” (sounds like realtors are keen to shed the Southwest Philly moniker) and East Parkside, where rents are up more than 10 percent in the last quarter. But the most expensive neighborhoods in the city remain west of Broad (from Logan Square south through Rittenhouse Square and west through University City) and in Northern Liberties. Rents in University City and Logan Square are the priciest, at $1,800 monthly. An artist’s rendering of the eastern portion of the Hanover North Broad project at Broad and Callowhill Streets. A total of 3,127 new units are scheduled for delivery this year in an area largely bounded by Girard Avenue to the north and Tasker Street to the south, between the Schuylkill and the Delaware River, the report’s authors said. That’s a 71 percent increase over 2016 levels and nearly three times the average annual increase in new apartment units tracked by the Center City District (CCD) between 2010 and 2016, the report said. Though central Philadelphia’s career opportunities, cultural offerings, and other assets have been drawing ever more new residents, that part of the city faces headwinds that could keep population growth from keeping pace with new apartment supply, the authors wrote. Since 2000, the group said, 20,705 units of all kinds of housing have been added to the area it calls Greater Center City, corresponding to a 19 percent increase in population to almost 190,000, the group said. In 2016, a record 2,506 new residential units were completed, surpassing the previous high of 2,168 units in 2013, the CCD said. Philly is 3rd on the List of Buyer's markets, after Baltimore and Miami. For Philly, 13% of properties had price cuts, and properties were on the market 101 days, on average. This was a little better than Baltimore, also at 13% average price cut, and 104 days. Adie Tomer, a fellow with the Metropolitan Policy Program at the Brookings Institution think tank in Washington, said Philadelphia is following in the footsteps of cities such as Denver and San Francisco that also have relaxed height limits and parking minimums in what have been successful campaigns to encourage building around transit stops. "Philly is not reinventing the wheel here," he said. "It's following the playbook we see in other markets, and that's a good thing. " Philadelphia's proposed ordinance does not identify which stations would be surrounded by TOD Districts, so that they can be designated in consultation with the Council members in whose districts they would be located, said Reynolds Brown, an at-large councilwoman not tied to any district. A recently leaked list of 50 priority projects suggests, somewhat hopefully, that the answer is a little of both. Though there is no way to know whether the list is fake news, it is encouraging to see several important rail projects ranked high. At the top is the desperately needed Gateway Program, which would add a third Hudson River rail tunnel and increase capacity on Amtrak’s dangerously overstretched Northeast Corridor. Sadly, no Philadelphia rail projects rate a mention -- neither the Navy Yard nor King of Prussia extensions -- but at least the city’s I-95 bridge repairs come in at No. 6. Where does that leave SEPTA, which struggles just to keep its existing fleet in operation, and is now in Year Two of a slow-motion fare-card rollout? At this point, the city’s best hope for transit improvements may be in thinking small and local. Next month, the University City District will break ground on a project that harnesses local funds for maximum impact: It will transform SEPTA’s 40th Street Trolley Portal from a concrete Sahara into a verdant parklike oasis. 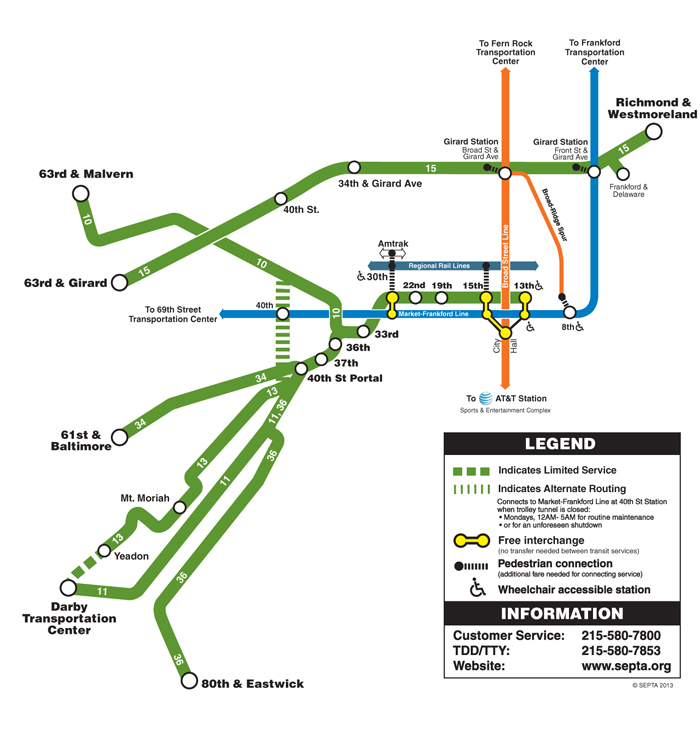 All but two of SEPTA’s trolley lines serving West Philadelphia converge there, making it one of the biggest stations in the transit agency’s network. Yet, despite the large number of people who pass through the station, there are no amenities, and no reason to linger. mo Ph-Zhv : YoYr : Nyc_Zhc : YoYr : 20cityI : YoYr : condo: C-NYC : C-NyNs: C-Wash C-Bost. Zillow predicts Cobbs Creek home values will increase 0.5% next year, compared to a 3.5% increase for Philadelphia as a whole. A new Redfin report finds that New Yorkers and Washingtonians were most likely to search for homes in Philadelphia than their own hometowns. Philly has some obvious draws for New Yorkers and Washingtonians, namely lower median home prices. For example, according to Redfin’s own data, Philly’s median home price was 59 percent of the $375,000 paid for a typical home in D.C. in March. Young adults are more likely to own homes and make more money than their older peers in Philly than any other U.S. city. A new report by Trulia reveals that the lack of affordable and available homes for sale is making it a really tough market for first-time homebuyers. What is the longest street in Philadelphia? Broad Street is the longest and the widest street in Philadelphia. At 12.5 miles, it is also the longest urban street in the US. Libraries have a long, long tradition in Philadelphia. Spot the good, bad, and expensive before making an offer. The first walkthrough of a home is when potential owners get that gut feeling and come with their buying wishlist in tow. And while you’ll know if a potential home meets your basic requirements—from the number of bedrooms to the availability of outdoor space, you won’t know every detail of a home the first time you view it. One of the most important factors to consider is how much work it’ll require. Is it move-in ready, will it need a few upgrades to accommodate your needs, or is it a full-on gut? Curbed spoke with a home inspector and architects who specialize in home renovation on what you should look out for before you pull together a down payment and take the plunge on a new home. Electrical and plumbing issues will be hard to decipher with the naked eye. Ingui says he likes to check how the electrical boxes are sorted. Is there a lot of exposed wiring? Does it look like it was installed correctly? Take a look at the electrical panel and ask the homeowner if they experience regular electricity shorts, and be very wary if the system hasn’t been replaced in a few decades. For both electrical and plumbing matters, it’s a good idea to bring an expert along for a second walk-though. You can also follow up and test the pipes using a water kit, which you can secure cheaply, or in some places free through the state. “It’s a way to check how much lead, or anything else, is in your water,” Briggs says. If you’re feeling good after the walk through, get to work investigating any open violations or permit issues the home may be saddled with. Check the local building department, fire department, and historic agencies to make sure the building comes out clear. “It’s very important the home has a clean bill of health with local government agencies,” says Briggs. He also recommends checking if a neighbor has filed complaints with the home—and follow up with the neighbor, if so. Numerous complaints may signal that there are problems with the property, or that the home will come with a sensitive neighbor. Make sure, too, all work that’s been done in the house was filed with the local buildings department. “Sometimes you’ve got home extensions that the town never knew about,” Ingui says.